The 1980s horror craze wasn’t strictly an American phenomenon. Across the pond and to the south a handful of filmmakers were crafting their own vision of gore and mayhem. Their craft, vision and technique set them apart in many ways. Some good, some not so good. One of the stand-outs is Demons. Released in 1985 it’s possibly the most popular and/or successful (in the U.S.) of Lamberto Bava’s work. 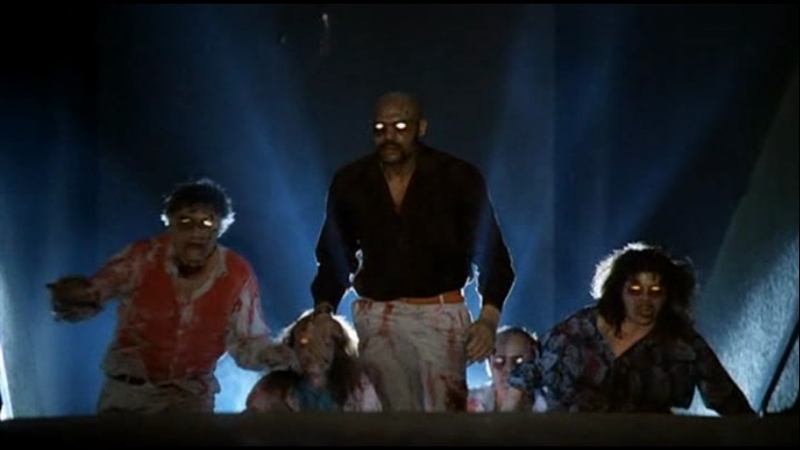 Co-wrote and produced by Dario Argento (Suspiria, Deep Red), Demons is a hard rockin horror in which moviegoers at a midnight premire get trapped with an evil force inside the theatre. It’s a zombie survival style movie done with possessed living humans rather than undead corpses. The American version’s voice over (if in fact it is voiced over) is pretty bad, adding a large dose of campy/silly to an otherwise fun over the top gore fest. Trust me when I say gore fest. It was the 80s and practical effects were cutting edge and horror movies were always trying to push the boundaries. Much like Evil Dead 2, this film has a ton of yellow, green, blue, and red fluids oozing out of every opening, socket, pore and membrane. Some of it’s is silly and some of it is done really well. Adding to the awesomeness is the soundtrack. Bava those in songs by Motley Crue, Billy Idol, Rick Springfield, and Go West. Then he slathers on even more awesome sauce by having Claudio Simonetti write additional score for the film. Who is he you ask? He’s none other than the keyboard player for Goblin, the band who scored Romero’s Dawn of the Dead, Argento’s Suspiria, and more! This film is universally reviled as poor, but equally loved as a mainstay of 80s horror. When you consider the hero not only hacks away demons with a katana while cruising a dirt bike up and down the aisles how couldn’t this film be a keeper!